I selected Haig's Enemy to review because I knew next to nothing about either Crown Prince Rupprecht (1869–1955) of Bavaria or his role in the Great War. 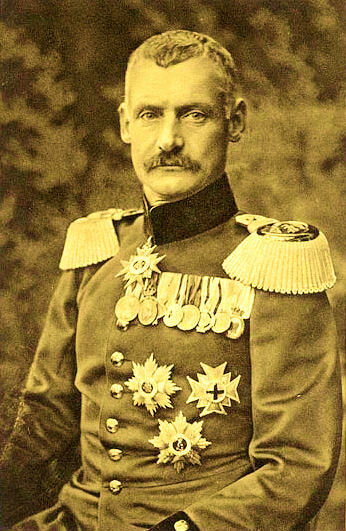 In August of 1914 Rupprecht's counterpart, young Wilhelm of Prussia, had been the crown prince since he was six, while Rupprecht was just getting used to being one. His father Ludwig (1845–1921) was not born in line for the throne, but due to the instability and ill-health of his cousins, Ludwig II (1845–1886) (of Schloss Neuschwanstein fame) and Otto (1848–1916), he ultimately became King Ludwig III in 1913. At the start of the war, the elderly Ludwig III was unfit for field service, fortuitous because he had no interest in the war, and he became more so inclined as the war progressed. By 1918, when Rupprecht tried to share his concerns about Germany's position with his father, Ludwig wanted to talk about new uniforms instead. 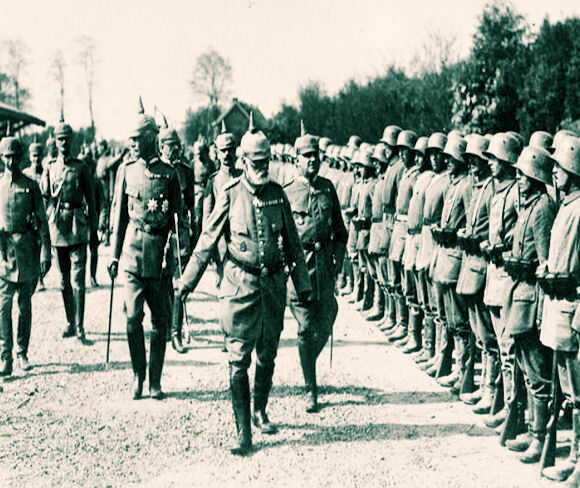 So in 1914 Rupprecht, an unusual royal in that he was a career soldier and a properly promoted general, was given the supreme command of all Bavarian forces. This wasn't as big a deal as it sounds because Bavaria constituted only around 10 percent of the German Empire's population and thus of its army. Rupprecht's first command in imperial war service was the largely Bavarian Sixth Army, which began the war on the Vosges Front but was quickly shifted to Flanders during the Race to the Sea and thereafter opposed the British Expeditionary Force (BEF)—hence the title of this book. In July 1916, Rupprecht was promoted to field marshal and given the command of a new, four-army Group headquartered in Lille, still fighting the BEF. As a soldier first, Rupprecht took his responsibilities very seriously. He felt unable to leave his post when his eldest son died—in fact he didn't take any home leave until the end of 1916. Boff has based his work in large part on the war diary kept by Rupprecht, which ran to 4,197 pages in manuscript, but only a little over 1,000 pages were published in 1929. Parts of the book are not found in the manuscript, so were not contemporaneous but were derived from notes, letters, and recollection. In Boff's opinion the published diary reflects Rupprecht's tweaking of the facts to make himself look better. Boff states "Nonetheless it would be silly to claim that Rupprecht was one of the great captains of history. The First World War did not produce many of those. It did shatter the reputations and careers of many, though, and Rupprecht was good enough to avoid such a fate." In addition to the diaries, Boff also relies on many other documents that he found in the Bavarian archives, which were spared destruction during World War II unlike most of those kept at Potsdam. In fact, Boff says in some instances the only extant copies of orders, plans, and studies from WWI are in Bavaria. Military procedure, German efficiency and royal protocol ensured that the Bavarian high command was "kept in the loop" even when not directly involved. At war's end, Rupprecht was listed by the Allies as a war criminal (number 33 on a list of 895 names), accused of ordering reprisals against French citizens in Lorraine in August 1914 and of ordering his soldiers to kill British prisoners the following month. With Spanish assistance, Rupprecht fled to Amsterdam, under the name "Landsberg." A year later he was able to sneak back into Bavaria, still incognito, and the charges against him were dropped in 1923. While Rupprecht's biography is interesting, the greater contribution of Boff's work is the blow-by-blow description of the conduct of the war in the West as seen from a high-level German perspective. For example, we learn that Rupprecht's Army Group was always short of men, bullets, shells, and even guns, and as the war progressed, on any given occasion the BEF could outgun them. The battlefield defeat of the German army in 1918 was at least as much the result of the Germans getting worse as it was of the British getting better. The war which emerges from this book is one of radical and dynamic change where the ability to outthink your enemy was just as important as being able to out-muscle him. It took both sides time and immense effort to adapt to the new ways of war, not least because every time they came close to an answer the enemy changed the question. Eventually, however, the German army was dragged down by its inherent weaknesses and fell behind in the race to adapt. The results were disastrous. Sometimes Rupprecht and his colleagues were constrained in the choices they could make, but the decisions they took were nonetheless too often poor. The First World War was not just a war of bodies and a war of machines: it was a war of brains. The Germans lost all three. The German army sought to address operational and sometimes strategic problems with tactical solutions. The German army's confidence in its ability outran its capability and led it to allow a probably unwinnable war to be fought. Altogether, Boff has written a work that is both an engaging study of Rupprecht and a thought-provoking analysis of the performance of a German army in the West. Included are 13 detailed and easy-to-read maps of the major battles fought between Rupprecht's armies and the BEF, plus an unusually detailed index. Haig's Enemy is a worthwhile read and, at 284 pages plus extensive notes, a good book for a long weekend. Thank you for the review of what sounds like a fascinating book. And bravo to good maps! Does he give any insight as to what Rupprecht thought of Haig? Thanks for this interesting review. I knew nothing about Rupprecht.